Completed May 2018. As featured on Grand Designs NZ, 10 Oct 2018! Nestled harbourside in Mangawhai, Wāpu Gables is a stunning new home that whispers of a unique and proud New Zealand heritage. 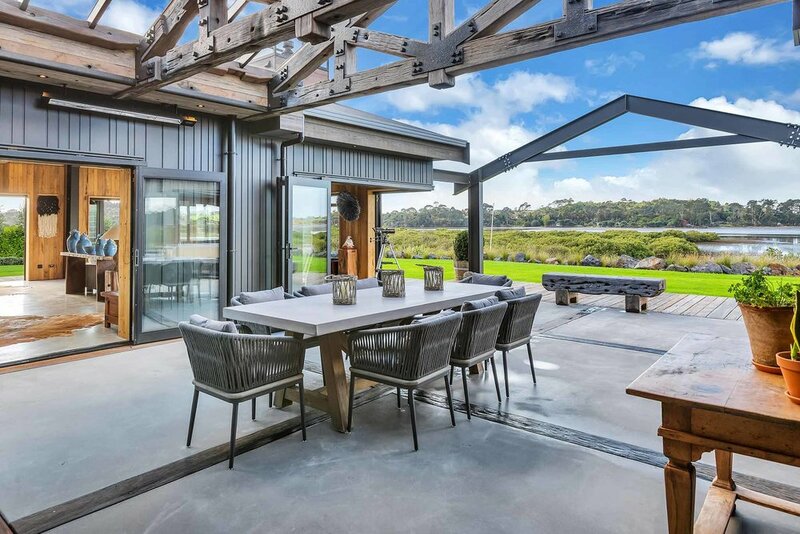 Incorporating beautiful recycled building materials from a number of locations around the country, Wāpu Gables is a true celebration of past and present. Exotic materials included pre-World War II bricks from Queen Street’s iconic ‘Real Groovy Records’ store, 100 year old hardwood that once held up Tug Wharf along Wellington City’s waterfront, 30 year old structural metal from Waihi, originally a holding tank for cyanide. The entire project required precision and craftsmanship from Smith Construction, and the result couldn’t be better. Modelled on a contemporary boatshed theme, the client brief called for sensitive architecture that would blend into its coastal environment, along with a distinct industrial theme. Architecturally designed by Frank Stanton of Dream Planning Ltd, the three-bedroom home appears as four simple pavilions, however on close inspection, each one contains a number of complex interior and exterior steel structures - designed to support the extensive use of recycled and unique materials. Smith Construction both applauded, and at times cursed, working with old reclaimed timber. The project called for patience, attention to detail, and plenty of tool sharpening! Throughout the project, Smith Construction collaborated daily with the client, architectural designer, and Mike from Big Woodies. We believe regular and open communication was the success factor behind this luxurious home. “Smith Construction is our preferred local construction company. Their professional attitude and attention to detail has enabled them to perfectly realise the vision of this complex home.” Architectural Designer, Frank Stanton, Dream Planning Ltd.
“We congratulate our clients for having such a bold vision. Every single feature in this design was vital towards the end result. The trusses alone carried a 10-tonne weight. These lofty giants straddle both the main living area (the Great Room) and form a roof to the ocean-facing courtyard. Exposed steel beams and framing were crucial in a structural sense, but also sit perfectly with the industrial theme. The overall home is incredible, it pushed our expertise and craftsmanship, and the results show.” Smith Construction founder, Nick Smith. 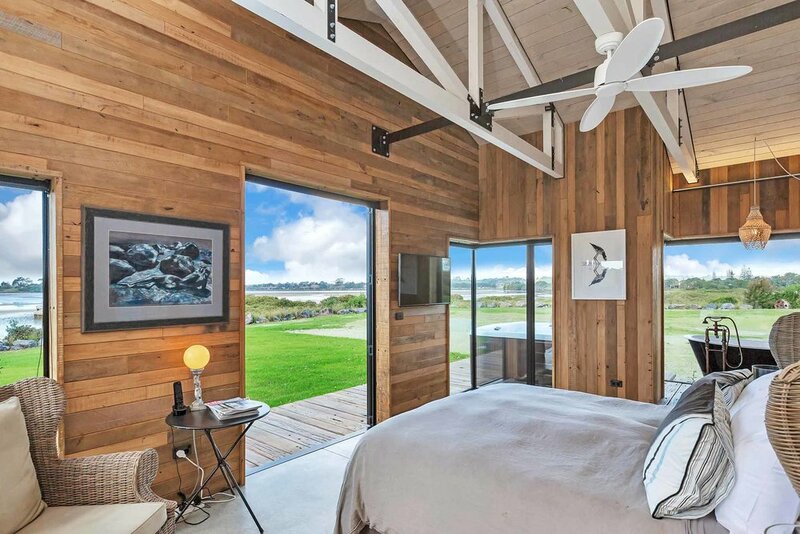 Recycled rimu sourced from demolished buildings has brought the boatshed vibe to life and has been heavily used as internal sarking and feature sliding doors throughout the home. Vertical weatherboard cladding with random profile widths, further enhances the timber boatshed theme. Formed from aluminium, the exterior cladding offers long-term protection against the salt-air coastal environment. Thoughtful placement of windows, bi-folding doors, and shutters maximises the water views and captures sunlight, but also shields the home from intense summer heat. To support a family who love to entertain, large barn doors slide back to reveal a spacious scullery linked to the Great Room kitchen. Not one inch of the rough-hewn recycled timber has been wasted, with offcuts applied to form decking around the house and imbedded into the polished concrete courtyard floor. The master bedroom offers expansive views of the waterfront and is a special place for our client to unwind in an old cast iron bath sitting on a handcrafted plinth. A guest bedroom, bunk-room and large double garage completes the picture of a majestic beach house befitting of its coastal location. We have just completed a build in Mangawhai and found this to be (unbelievably) a very pleasant and fun experience. We attribute this to the team of builders from Smith Construction. “We are not novices in the building game, we have built and renovated previously so we knew what to expect. What we didn’t expect was how easy Smith Construction made this whole process given building is a mine-field of consents, compliance, safety rules, council and engineering requirements to say a few! We worked as a team on all aspects. There was mutual respect for our ideas which sometimes were a little unusual, but not once did they say it couldn’t be done. The boys made constructive suggestions to get our requests realised. Nothing was too much trouble and given the upcycled materials used, the quality of workmanship was second to none. Having enjoyed the experience we would build again, and we would not hesitate to work with Nick and his team. We welcome contact to discuss our experience.” Patty and Geoff Coley.